Domino didn’t know it yet, but Monday was going to be a life-changing day for him. That was the day that Mary would be taking him to the vet for his surgery. Mary had taken the day off from work. Domino didn’t seem to understand why nobody fed him that morning. He was whining and pushing his food dish around with his nose. Amber brought the flyer to school so she could show it to her friends. She had worked on it for two hours on Sunday afternoon and was pretty pleased with the results. 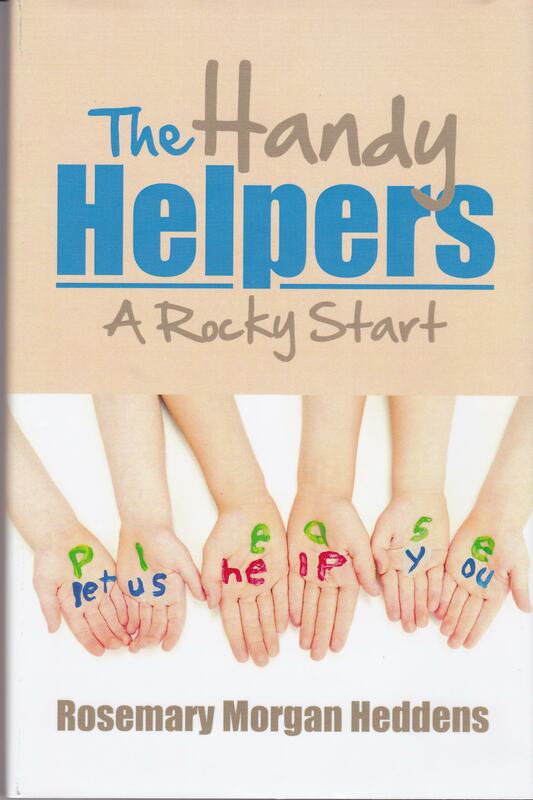 At the top of the flyer, in her best fancy lettering, Amber had put the name of their group, Happy Helpers. Then she wrote their names: Melissa, Laura, Amber. Beside each name, she drew a little picture. Then she printed these words: “Helpful jobs we can do—dusting, sweeping, window cleaning, yard work, and shopping. Call when you need help around the house. We will be happy to help.” When she was finished, she showed it to her mother, who told her it was perfect. Melissa and Laura agreed. “Then the Happy Helpers will be in business,” Amber said with glee. After school, the girls rode their bikes to the senior center. Mrs. Snow accepted their applications to become junior volunteers. She explained that the volunteer assignments are posted every Monday afternoon. With their heads together, in whispered tones, the girls talked about Laura’s sleepover on Friday. They all decided that if they didn’t stay up too late, they could be at the senior center by ten. “You can put it up on the bulletin board next to the one for Three Handy Guys,” Mrs. Snow offered. “I’d never tell.” Melissa laughed. “That wouldn’t be very nice.” Laura pretended to be shocked. “And better too,” Melissa added. The sound of a door closing made the girls look in that direction. “Who was that?” Melissa asked. “It looked like Spike,” Amber told them. “Woops,” Melissa said with a little giggle. When Amber came home from school, Domino was lying on his bed with a sad look on his face. He was wearing what looked like a lampshade around his neck. “I’ll be careful,” Amber said as she knelt down to pat his head. Domino nuzzled her arm and seemed to be begging her for help. “What is that thing around his neck?” Amber asked. By the next afternoon, Domino was getting around a little better. When Amber got home, she saw her mom returning after taking him for a walk. “How’s he doing?” Amber asked. Once they were inside the house, Mary told her daughter to change her clothes right away. By the time Amber and Mary arrived at the baseball field, the game was in the third inning. They quickly located John and took the seats next to him. The Bluesky Bulldogs were playing their rival, the Clear Creek Cavaliers. The score was three to nothing. The Bulldogs had the nothing. The Cavaliers were up to bat with two outs. Kyle was behind the plate, wearing his catcher’s gear. A cracking noise told Amber the ball had been hit hard. She watched as it popped straight up in the air and came down right into Kyle’s mitt for the third out. Play continued for the next two innings with no runs by either team. Then in the bottom of the sixth, the Cavalier’s pitcher walked the first batter. The next batter hit a line drive down third base. Now there were runners on first and second. A pop fly was the first out. Next came a grounder to center field, and the runners advanced. The bases were loaded when Kyle came to bat. As his bat connected with the ball, the loud crack brought the spectators to their feet. The sound of cheering was deafening as his ball sailed over the left-field fence for a four-run home run. The rest of the game was uneventful, but Kyle’s grand slam assured his team of a four-to-three victory. Amber yelled and jumped up and down with the other Bulldog fans. But in the back of her mind, she couldn’t help thinking about how living with Kyle wasn’t going to be easy for the next few days. Later, at the pizza parlor, Kyle had to relive every dramatic moment of the game. If that wasn’t bad enough, every few minutes, someone was giving him a high five or patting him on the back. Then he would start replaying the game all over again. To make matters worse, Amber spotted Ms. McGuire in a booth with some friends. After their server finished taking their order, Ms. McGuire walked over to the Snyders’ table. “Hi,” she said to everyone. “You seem to be the hero of the day,” she said to Kyle, who was beaming with pride. “How’s your report coming?” she asked Amber. “Fine,” was all Amber said. “She won’t tell us what her topic is,” John said. “Then I won’t spoil her surprise.” Ms. McGuire smiled at Amber as if they shared a big secret. After she left, Mary shot her daughter a “what did you do?” look, to which Amber only shrugged. “And the drama continues,” Kyle said, rolling his eyes.